When new Leslieville business owner and resident Brad Daniels first bought the property at Queen Street East and Hastings Avenue it was emblazoned with a fantastic mural of Jimmy Hendrix. This image had become a local landmark over the 20 years it was in place. In order to modernize the building and make it his own, Daniels has resurfaced over the original mural but not before taking a large format image of the Hendrix piece. He then placed the original image on a 10’ by 16’ canvas affixed to the side of the building, and the following year allowed the neighbourhood to choose the next mural in the Inaugural Leslieville Mural Competition. The winner last year: Nayoun Kim's image of Elsie MacGill, Canada's first female aeronautical engineer. Elsie MacGill was the first woman to receive an electrical engineering degree in Canada and the first woman aircraft designer in the world. During World War II, Elsie MacGill oversaw the design and production of 1450 Hawker Hurricane airplanes in Canada, earning her the nickname "Queen of the Hurricanes." Elsie MacGill was also active in women's rights issues and in 1967 was appointed to the Royal Commission on the Status of Women. 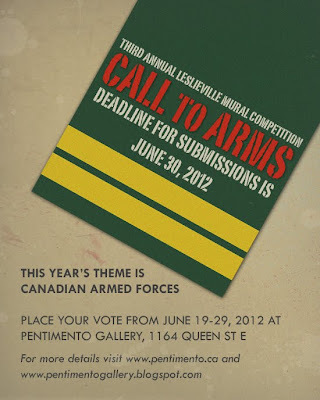 Brad Daniels in conjunction with Pentimento Fine Art Gallery presents the third annual competition for artists, based this year on the Canadian Armed Forces. The winning entry will be chosen by a neighbourhood vote from the 30 images chosen by a jury of experts. The top 30 images will be presented in a gallery show at Pentimento from July 19th to July 29th, 2012. The winning image will be affixed to the side of the building on Queen Street East for the period of one year and the winner will also receive a $500 cash prize. 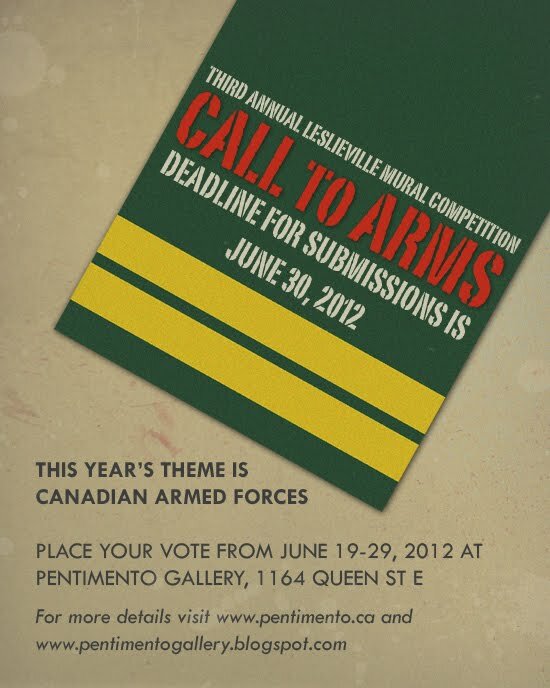 Please forward your 10"w x 16"h submission saluting the Canadian Armed Forces in jpeg format to RockinRolland@sympatico.ca with the title "Entry for Leslieville Mural Competition" by midnight on June 30, 2012. Selected images will be notified by July 7th concerning their participation and further instructions with regard to the framed work. GOOD LUCK!! !